"Peppers stuffed with rice and ground beef, seasoned Puerto Rican style. It's a combination of a few traditional stuffed pepper and Pastelon recipes. I used homemade sofrito, but you can substitute with the Goya® stuff. It's easy to make and delicious served with plantains. I like a lot of filling in my stuffed peppers, so this recipe only yields 4 peppers." Bring a large pot of water to a boil. Cook bell peppers in boiling water until softened, about 10 minutes. Arrange peppers in a baking dish with the cut side on the bottom of the dish. Bake peppers in preheated oven for about 10 minutes. Remove from oven and set aside. Heat oil in a skillet over medium heat. Cook and stir onion in hot oil until fragrant, about 2 minutes. Stir sofrito, garlic, salt, cumin, oregano, and black pepper with the onion; let mixture cook together for about 1 minute. Break ground beef into small pieces into the skillet; cook and stir until the beef is crumbly and completely browned, 7 to 10 minutes. Stir tomato sauce, capers, and rice through the beef mixture; spoon into the peppers. 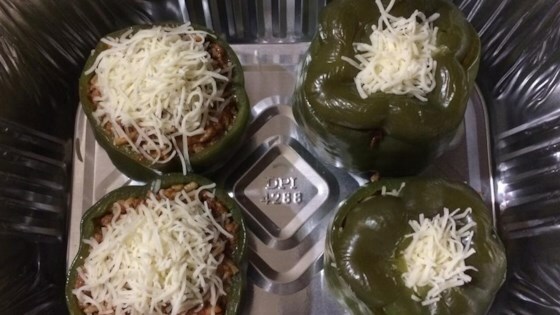 Sprinkle cheese over the top of the stuffed peppers. Continue baking in oven until the cheese is melted, about 10 minutes. Tasted pretty doggone good :-) Will add a little more salt next time though but enhance the already wonderful flavors!